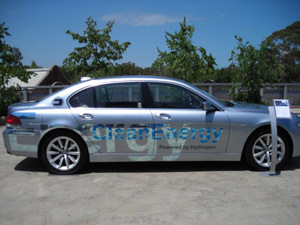 The BMW Hydrogen 7, a hydrogen hybrid looks like any other of the BMW 7-Series models except it carries a V12 engine and a specially designed crash-proof hydrogen tank for its liquid hydrogen fuel. The car is not yet available in Australia because of a lack of infrastructure. Several other parts of the world namely parts of California, Norway and Japan who have all created 'hydrogen corridors' where hydrogen refuelling stations have been established and small numbers of hydrogen cars are being tested. Even though the BMW is not yet available to the 'common people', it is being marketed as an accessory for executives, movie stars, artists and sports personalities, a similar approach as was taken for electric hybrids. Noted celebrities currently driving the cars around L.A include Will Ferrell, Edward Norton, Jay Leno and Jennifer Garner.